"99% of what your Pastors and GOs taught you is false! How can his name be ‘Jesus’ when the letter ‘j’ was not part of the English language until 1634? Here is a copy of the original translation of the King James Bible completed in 1611. -How can his name be Jesus when the Hebrew alphabet doesn’t have a ‘j’ sounding letter? from the Jews. If salvation is from the Jews, why do we have a Latin Jesus, but obey the law of moses and pay tithe like the Jews?� The names ‘Joshua’ and ‘Jesus’ are exactly the same word in Hebrew and Greek, the Bible’s first languages, the names were separated in Latin.... why? Yeshua, which means salvation! the name Jesus has no meaning, it’s an invention! This is a typical example of the adadge, ''you can take a horse to the river but sure can't force it to drink water''.. Sebi he has said his own?, ok we've heard you Daddy freezer abi kï lö rú kò rè?, come and be going, that's how every body dat don't have work will just wake up one morning & start looking for cheap publicity in this We Naija!, wetin we nor go see & hear?, But I also do blv that everyone is entitled to his/her own opinions and beliefs so to say. 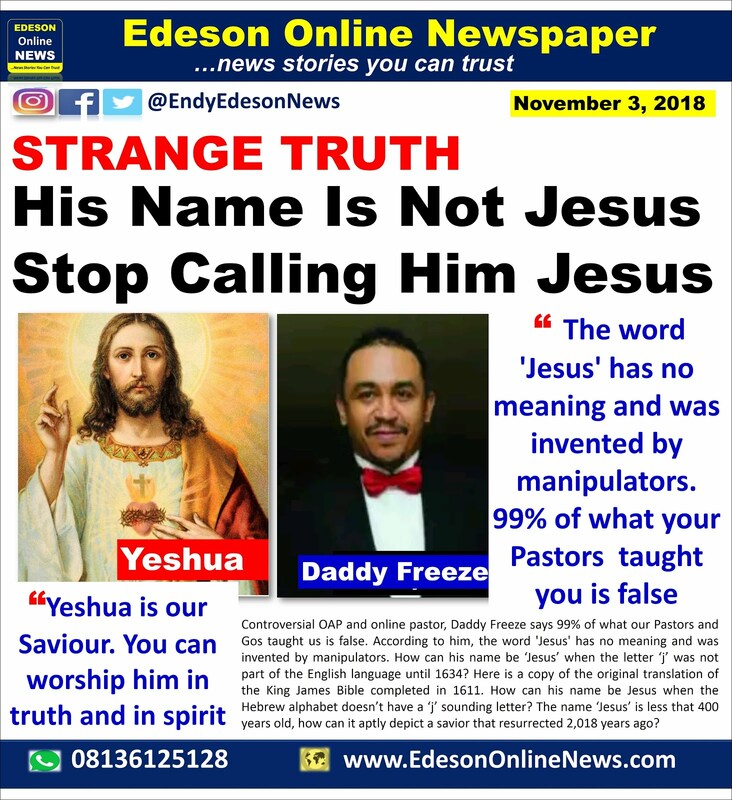 But my anger here is that why will anybody say this & want everyone to just blv him if that person isn't the anti Christ or they have that ill intention to mislead others?. Freedom of speech & press no mean say we go dey blasphem join, there is a limit to it, and papa freezer just exceeded his. Happy Sunday bruv. EVERYONE IS ENTITLE TO HIS/HER OPINON. OUR BELIEVE SYSTEM IS A FUNCTION OF OUR CONVICTIONS. YESHUA HIS IS NAME, JESUS HIS IS NAME. 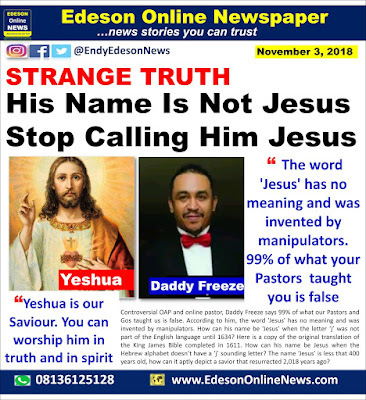 when you argue the things of the spirit with a man of flesh, you get confused...Daddy whatever cannot tell me what is inside the bible...he doesn't have the qualification to preach the bible to me.."you shall know the truth and the truth shall set u free"
And the English meaning of Jesus is equally SALVATION.